Blazingly clear Arkansas rock crystal triplet, each of the three with an uncommon 7h face, each of the three with a chip [two tips], two of the three with small contacts. Salt-and-pepper blue [shale] phantoms, wild foils and rare multicolor iris. 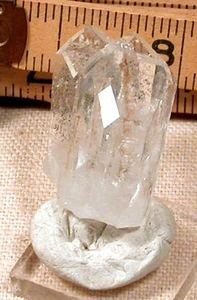 1x 1-1/2" overall with a rainbow twinned 1/4x 1/2" tabular crystal doubly-terminated on the side. Write when you get back from that overdue meeting with your spirit guides.